Big storm coming this afternoon and on into tonight with strong – hurricane strength – straight line winds and even tornadoes. Lot’s of rain and just generally nasty. I’m ok with the rain but the wind, not so much. I’ll be tying down all the dock furniture and anything loose. I frequently mention how good my garden soil is and this week I got a first hand reminder of just how bad it was when I started. Garret’s wife, Ginny, has decided she wants a garden and got started on it yesterday. I was there working on the new plumbing and she asked me to give her some advice on locating the garden. She had a great sunny location picked. It had previously been a large patch of black berry bushes – aka a dense bramble patch that put out mini wild blackberries. They had mowed it to ground level a month or so back but it was starting to sprout back. She wants to save a few and cultivate them to produce berries. I have my doubts about that but it’s worth a try. She started digging out the unwanted plants and found it was like digging into concrete. It looked like simple sand but when you went dig in – rock solid. The small sand particles are very dense and pack tightly. It brought back memories – actually nightmares. If you try to poke your finger into the ground it will bottom out about an inch in. Contrasting that to the garden, I can push my whole hand in wrist deep and even deeper than that in some places. With any kind of garden implement such as a hand shovel, it’s easy digging 18” deep and has the texture and color of chocolate cake dough. When I use the small electric tiller it sinks immediately down to the body of the machine. If we try that at Garret’s, it will be tough going getting a bite of even an inch or two so it will have to be turned initially with something like a pick. Most folks give up pretty quickly or elect to do raised beds with store bought soil and compost. That’s exactly what Joey did. It costs money but it gets instant results. Nancy made the creamed New Zealand Spinach using a recipe she got from her South Carolina niece. She had emphasized how much shrinkage there would be so I cut a full grocery bag full, which I estimate to be about 5 gallons. I picked the leaves off the stems which yielded about 2.5 gallons; stems to the compost pile. We split the leaves into 3 one gallon zip lock’s. I weighed the bags and they were 10 oz each. That, plus I now have a good feeling for how much we’re giving someone when we provide a full grocery bag. Last week we gave 6 grocery bags to the bridge ladies and I know that will hold them for a while. I did the measurement only because the recipe called for 8 oz of spinach and wanted to be sure we were following the program. There was plenty of other food so if I didn’t like the spinach, no great loss. Surprise! It was quite good. The way the garden is producing the NZ spinach, we could virtually live on it and all the bridge ladies too. And as diligent as I’ve been in pulling out the renegade seedlings, more pop up randomly every day. If I’m Trump, I’m introducing the idea of repealing the 19th. If the bag is labeled Idaho potatoes and I cut one or two up to capture the eyes and plant them in my Florida garden – are the resulting potatoes Idaho potatoes or Florida potatoes? I’m calling them Florido or Floraho’s – that assumes they’ll survive and thrive. A few years back I tried my luck with potatoes and was nominally successful but the current garden soil is an order of magnitude better (for root crops) so my expectations are higher. Check out this cabbage. It’s a new variety called Murdoc and is touted as excellent for slaw and cabbage salad. We’ll confirm or deny that later this week. The entire row you see includes 4 cabbage varieties including Chinese. We picked one of the Chinese last week and split it right down the middle – half for us, half for George and Barbara. That monster had to weigh 15 pounds; the Murdoc in the pic is about 10. One thing that’s changed this season is that George and Barbara along with their grandson and his wife are more aggressively picking. There’s still plenty and we’ve given loads and loads of produce to Nancy’s bridge ladies and her quilting buddy Esther so it’s actually nice to see it being eaten this year. In past years we’ve ended up tossing quite a bit into the compost pile as it went past it’s prime and bolting – I hated that. It’s feeling like that’s not going to happen this year. The biggest hit is the accidental New Zealand spinach that totally self seeded from last year. I took 6 large grocery bags up to Crescent City to the bridge club last week and could do that this week if I want. Nancy loves creamed spinach and insists that I should like it too so we’re going to try to make some using the New Zealand spinach. She tells me it takes quite a bit of spinach to make a decent side dish so if I like it, we sure have what seems to be an infinite supply. I didn’t think I’d really like radish soup but she whipped up another big pot the other day and we really enjoyed it. It uses the total plant – root and greens – so there’s no cleanup, no waste and nutritionally loaded. George and I went out fishing for spec’s this morning and for a couple of hours was catching one with every cast. They’re still running smaller than in previous years but there’s certainly no shortage. I’ve also gone out a few times this week fishing for bass – it’s seasonally a little early but we’ve had a nice warm winter (so far). I managed to pick up a few small ones each trip so I’m happy with that. We got the second installment of the Blue Apron Christmas gift – 3 more gourmet meals; one fish, one chicken, and one pasta dish. We ate the fish already which included a side that included lentils and collard greens as the main ingredients. Neither of us had ever tried anything even vaguely similar. There was a strange spice neither of us had ever heard of – Ras el Hanout that had a nice hot bite to it. Once again when I looked at the ingredients my immediate thoughts were that I wasn’t going to like this and, if we did, there wasn’t enough food for both of us. Wrong and Wrong. What really made me happy was trying another recipe for collard greens. If we can locate that magic spice, the rest of the meal can be replicated easily. The nutrition sheet that comes with it said it was 650 calories and loaded with nutritional goodies. The second meal was called Pillard chicken with fennel and potato. Pillard apparently means pounded or flattened since that’s what you do with the chicken breasts. After making 5 of these meals another common element is the use of lemon zest and juice liberally. That’s not something we normally do but it really livens otherwise plain dishes. The veggie dish mixed boiled potato and roasted fennel (along with some lemon juice), salt, pepper, and drizzled with olive oil. Doesn’t sound all that good but it really was. Meal three was Bucatini Pasta Bolognese with brussel sprouts. All the previous comments regarding how good it was held true for this meal. Either it was easier to make or we’re getting used to the faster pace in cooking. Actually most of the cooking on this meal was on medium heat instead of high and we did 100% of the prep work before starting any cooking at all. I’m not much on brussel sprouts but they blended in just fine and I’m guessing they could be replaced with a cabbage – in which we have a large garden position. There was nothing exotic in this recipe so it will be easily replicated. We always have a few pounds of bucatini on hand as well as the rest of the ingredients. Progress on the house project – done externally and about half done with the plumbing. All the air conditioning ducting installed and we’re about a quarter of the way thru with the electrical wiring (including 100% of the digital wiring). I’m guessing all the plumbing and electrical will be done by the end of this month. It could be livable by the end of March. Had a funny one the other day. George has a local friend, an old country guy who’s lived in rural Florida all his life. He comes over fishing occasionally and always comments on the garden and, from time to time, takes some fresh produce. He has a garden that is much larger than mine but apparently not as productive. The other day he’s particularly effusive about how nice my garden is and how he just can’t get anything to grow. Then in the same breath he comments that I shouldn’t be using pine needles in the walking rows between the planting rows because it will make the soil too acid to grow garden veggies. I just looked at him and started laughing – does it look like it’s too acid to grow veggies???? He got the message and started laughing too. I’m guessing he’ll have pine needles in between his planting rows next season. I did a post cold spell garden check and was pleased that all of the newly germinated and/or transplanted seedlings made it thru. My largest transplant block is a 3’x6’ beet patch which I’ve loaded up with really tiny new beets. Beet seed pods contain multiple seeds so when they germinate you often get several bunched tightly together and unless you thin them properly, they never really grow. The surest way is to take tiny scissors and cut away all but the strongest looking one. It really difficult to separate them and plant each sprout independently but I always try. I think I may have made a breakthrough with this particular garden patch which, it turns out, is much, much softer than most other areas. That makes it very easy to pull out the individual seedlings without damage or much root disruption and even easier to plant them again with the appropriate spacing to avoid crowding. There’s always very high fallout in this process but I have high hopes after working in this soil. The variety is also one I haven’t tried in the past so this is a double test. With this last patch planted I am now officially 100% planted – no space for anything. In fact if I kept the plant spacing perfectly per packet instructions, I’m probably 110%. For example, yesterday I spotted a strip that was 5’ long x 6” wide and decided to try growing garlic. I did a couple times in Utah but never here so I stole a head from Nancy’s kitchen stash, broke it into about a dozen cloves and then loaded up the strip. Who knows?? Uh Oh – Nancy just opened a bag of potatoes and found several with “eyes”. That means more garden space issues since I just can’t pass up planting them. I have some flowers in one garden corner that are doing nothing but looking good. Would I rather have potatoes or flowers? easy choice. Way to go Donald. I don’t like CNN either. We’re having winter today. It was forecast to possibly freeze overnight but here at the lake I think we bottomed out at 35. We were saved by a brisk north wind that keeps any frost from settling and, in our case, picks up warmth from the lake. You can literally see the steam coming off the lake and I can imagine that “warmer moist” air protecting the garden. I did cover some seedlings and tomatoes last night and am hoping that was sufficient. I don’t expect the green beans to survive but they were fairly well picked out anyway. Next stop for them – compost pile. It should be warmer tonight and up into the 70’s by mid week. Maybe this is it for the winter!!! We fixed the last of the Blue Apron meals – a chicken stir fry dish with fresh Pok Choy. As with the other recipes, there was a lot going on in a short time so I was flustered most of the way. The rice came out not optimal but even so, everything else was great and even the overdone rice worked. I have to learn to read the whole recipe a couple of times before starting and then doing all the prep work in advance of turning on the stove or oven. I also need to arrange the ingredients convenient to the stove while something is cooking. Don’t have a glass of wine during the prep. This is all probably amateur 101 but my cooking projects have always been low and slow. I’m considering growing some Choy next fall – lots of varieties to choose among and they’re fast growing and “right” sized for us. I picked a Chinese cabbage yesterday. 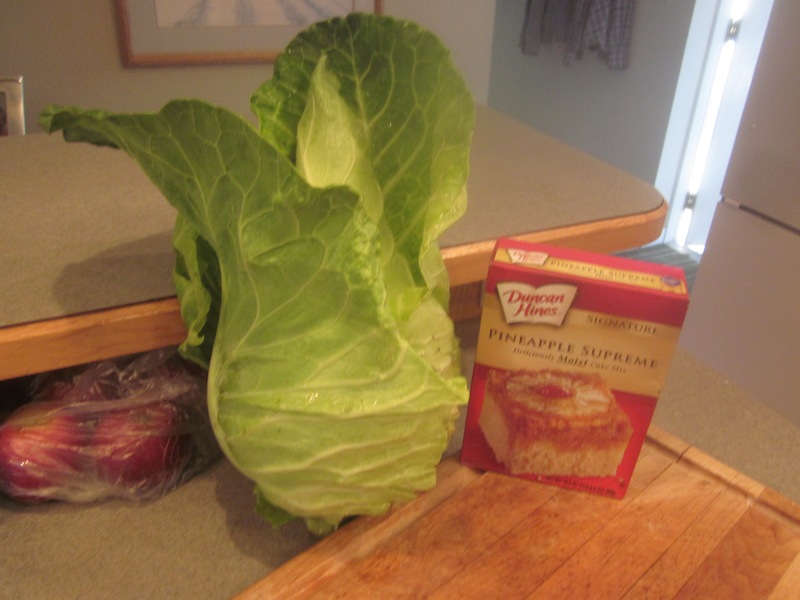 This guy had to weigh 15 – 20 pounds so I called Barbara and asked if she wanted half a cabbage. It was tasty but next season I’m switching to a much smaller, single meal size variety. I’m finishing up the winter growing season by finishing off the main lettuce patch and replanting it with beet seedlings and picking the main beet patch clean and replanting it with lettuce seedlings. The rest of the winter crop will mature gradually for the next month or so and be picked on an as available/as needed basis. At least half are leaf crops where we just cut leaves as desired and let the plant continue to produce until either the heat or bugs end the season. I’m ordering the spring/summer seeds this week so it’s more or less a continuous, non stop operation between now and June. I’ve studied the seed catalogs and selected a few old standbys and a few new items. I’m way overbuying new tomato varieties as they promise new levels of heat tolerance and disease resistance. I continue to try to find those one or two varieties that I can depend on season after season. Generally they never turn out as good as the catalog predicts but………… what’s a guy to do?? I think I’m getting a handle on this Trump character. He looks at every interaction as a prelude to a negotiation and is establishing a position with leverage. Talk to the Taiwanese to alert the Chinese that he has some leverage; ditto the Russians; ditto the Mexicans, folks in the middle East. With Obama, it became obvious to all that he would fold in a tough negotiation or retreat from any pressure point internationally. Even jerks like Assad just walked all over him. That perception of the US as a wuss has to be dispelled as a starting point. You know there’s going to be major league trade discussions with Mexico and China so start the positioning right away so there’s some leverage when the real negotiations start. Watch how quickly he ok’s the two stalled pipeline projects to make it understood that the US oil industry is open to grow. Very tough day ahead. It’s Monday and Nancy plays bridge in Palm Coast. Normally that would be ok but today is also the Florida/Iowa game. So my plan is to take her to her game about 12:30 then hit the surf (fishing) for a couple of hours, weather and tide permitting, then hit the Flagler pier – Funky Pelican sports bar. I pick her up about 4:30 so the game should be over by then. If the surf fishing is not working, I’ve got tackle to try Bulow Creek so I feel like all the bases are covered. And then there’s tomorrow. Nancy’s quilt buddy that loves beet greens is coming over to help Nancy cut out some material. I plan to pull the rest of the beets with her getting the greens and us keeping the roots. That triggers a series of events including loading that piece of garden with newly created compost. I’ll split the whole compost pile – about 20 cubic feet, between the previous beet area and the previous rutabaga area and then start a new compost pile – the July pile. Both of those empty garden areas will populated with lettuce seedlings – a red leaf variety that’s been incredibly successful and a traditional romaine variety. Then, guess what, it’s time to start summer crop planning. I had a really disappointing tomato crop last year and I’m laser focused on not letting that happen again. It hurt my heart when we had to literally buy about 10 pounds of fresh tomatoes a couple weeks ago to make a load of pasta sauce. We usually finish the summer with enough sauce frozen to last 6 months. This year we ran dry in October. Shame on me. We made another Blue Apron dish and, like the first one, it didn’t disappoint. The main ingredients of this were steak, potato, and kale. Once again the cooked veggie was the big surprise to me. I’m fine with raw kale but cooked???? It was really good and I see/taste the difference between these dishes and what we’ve done in the past. First, they cook very hot and very fast where we’ve always been cooler and slower. Next, they use quite a bit less oil than we normally do – they use 2-3 teaspoons where we would have used way more. The high heat/low oil approach means things happen much faster and you really have to be right on top of every step. For example the kale is cooked and ready to plate in about 3 minutes total. The potato was cut in half and then into 1/4” wide chunks, coated with 2 teaspoons of oil, sprinkled with salt and pepper and then cooked in a 450 degree oven for 16 minutes. If we had fried them in oil it would have been much different and if we had roasted them, the oven would have been cooler – like maybe 350 – and taken more like 45 minutes. They use more salt, pepper and other spices than we normally do. The next one up is a chicken dish with Pak Choy as the main veggie. I’ve never grown that mainly because I don’t know what to do with it. I haven’t looked ahead at the recipe to see if it follows the fast cook procedure and if the results are as good as these other veggie dishes. Update – no fish in the surf but a big gator win that I watched in Hooligans, a local sports bar. And Nancy had a good day at bridge.